Both jam and fruit preserves are forms of fruit products widely eaten as a food accompaniment. They differ in their ingredients, the physical form of fruit in them and in the way they are made. 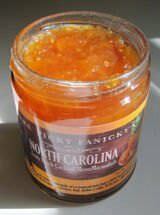 Fruit preserves refer to fruit or vegetables that have been prepared, canned or jarred for long term storage. Jam refers to a product made with whole fruit, cut into pieces or crushed. Preserves contain chunks of fruits but jams do not; jams contain fruit pulp. Preserves are spreads containing small, whole fruit or uniform-size pieces in a clear, hugely gelled syrup. Fruit is in chunks or pieces in them. The fruit in preserves is tender and plump. 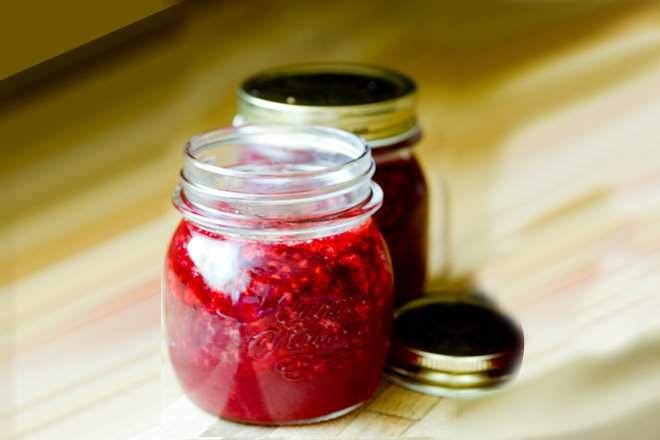 Jams are more of a soft pulp of the fruit and have the dark shade of its retaining fruit pulp. Finally, jellies consist of firmed fruit juice and contain no fruit pieces or pulp. 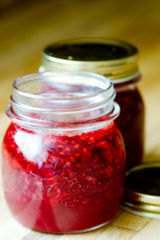 Jam: In general jam is produced by taking mashed or chopped fruit or vegetable pulp and boiling it with sugar and water. The proportion of sugar and fruit varies according to the type of fruit and its ripeness, but a rough starting point is equal weights of each. When the mixture reaches a temperature of 104 °C (219 °F), the acid and the pectin in the fruit react with the sugar and the jam will set on cooling. 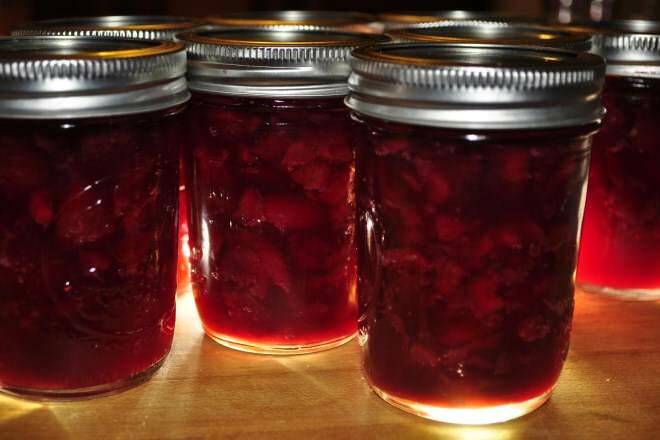 Preserve: To a previously agitated blend of fruit and sugar is added a water solution of pectin to form a premix which is heated to 90.degree.-125.degree. F. during gentle agitation. This is further heated after adding an acid solution and stirred all the time to obtain a concentrated product which is then heated to a sterilizing temperature and passed through a holding zone at such a temperature. The resulting product, after cooling, is a fruit preserve concentrated to a desired degree, such as 65.degree. The making of jam and fruit preserves began centuries ago in the Middle Eastern countries, where cane sugar grew naturally. It is believed that returning Crusaders first introduced jam and preserves to Europe; by the late Middle Ages, jams and fruit conserves were popular there. The use of cane sugar to make jam and preserve can be traced back to the 16th century when the Spanish came to the West Indies where they preserved fruit. Marmalade (a kind of fruit preserve) is thought to have been created in 1561 by the physician to Mary, Queen of Scots, when he mixed orange and crushed sugar to keep her seasickness at bay. In the United States, early New England settlers preserved fruits with honey, molasses or maple sugar. The Food and Drug Administration established Standards of Identity for what constitutes jam and preserves and fruit butters in 1940. Both jams and preserves have fruit, sugar and pectin. In preserves, the fruit comes in the form of chunks in a syrup or a jam while in Jam has crushed fruits or vegetable pulp. Most commonly available Preserve flavors are orange and mango while the most common Jam flavours are Orange, Mango, Mixed fruit and Strawberry. Jam is generally used on bread and spread on top of it. Preserve, though similar to it in looks but isn't spread as it has big chunks of fruit in it. This can be eaten as it is with a spoon.